One of the rising stars in the GOP is Marco Rubio. Born to an immigrant family who not only fled Cuba, but his father actively fought against the Castro regime. Needless to say, we haven’t seen the last of Rubio, and he is one of the frontrunners in the presidential election cycle. 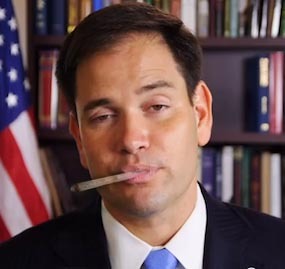 So where does Rubio stand on marijuana prohibition? Unfortunately he wants to take a few steps back. Here is a compilation of some quotes from Rubio regarding the use of cannabis both for medicinal purposes as well as recreationally. This is an odd statement to make. Since it is generally conservatives who are supporters of state’s rights. However here we can see that Rubio is taking the position that the Federal government should have the ability to usurp the rights of the states and enforce their will on the people and change what they have voted for. Its odd to me because politically it’s a no brainer to just allow for state’s to control their own laws regarding the use of Cannabis. This is easily rebutted. Because the belief that anyone is “adding another mind altering substance” is grossly misinformed about marijuana usage rates. As we’ve seen and reported on here previously, the teen use of marijuana is actually going down in Colorado. So much so that the new marijuana start ups are actually hiring PR teams to try and rebrand the substance ( it’s associated too much with lazy stoners and they want to appeal to the new demographic which is seeing a rapid increase in usage. Middle aged professional women and mothers.